It’s easy to catch sunset. You start to notice the light softening and getting longer (in terms of wavelength λ – actually what happens is that the shorter wavelengths are getting kicked out by scattering off the atmosphere) and there are all these signs that it’s going to happen so you have time to get ready. Sunrise is another matter. Sunrise happens backwards and you start in the dark. In winter, you start in the dark and cold and lonely because everyone, including the dog, is snoring away under the covers still happily chasing bunnies in dreamland. Tons of people catch sunset, but not as many catch sunrise. Sunrise is glorious and I usually witness it alone, but it’s lovely to share with others too. I like sunrise because it’s the beginning of the day and I love beginnings. It means the long winter night is over, or it means you have a little peace before the mosquitoes of alpine summer begin to stir (and bite!). Sunrise can be quiet, peaceful, pensive. It also feels like opportunity. I’m feeling it! If you will recall I discovered the joys of single-ingredient ice cream a while back. 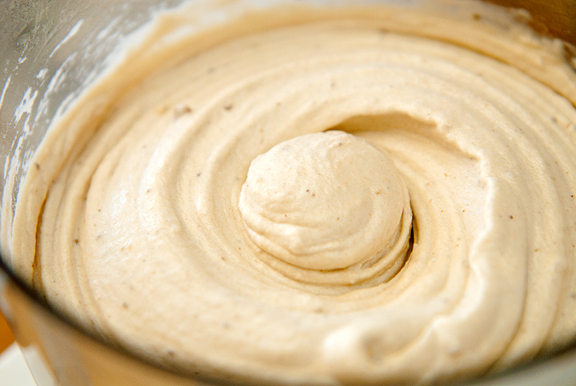 I finally found a way to use up overripe bananas as well as make a non-dairy ice cream alternative that is healthy and pretty creamy. It got me thinking about chocolate-dipped frozen bananas and how I had a lot of trouble eating those as a kid because the bananas were frozen solid like a rock. I wanted something similar, but easier to consume. Okay, I just wanted an excuse to use my bombe molds. They’re so cute and whenever you give someone a bombe, a smile spreads across their face. 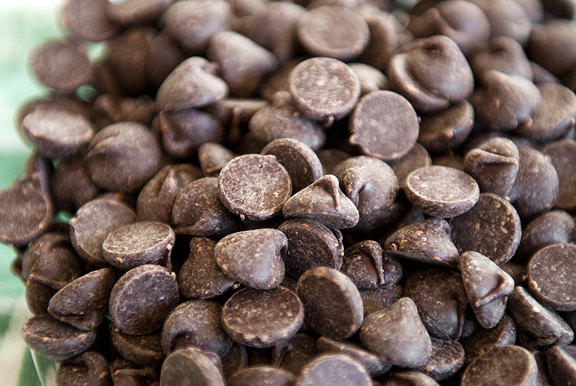 You don’t have to temper the chocolate, but if you do it winds up with a beautiful sheen and snap. 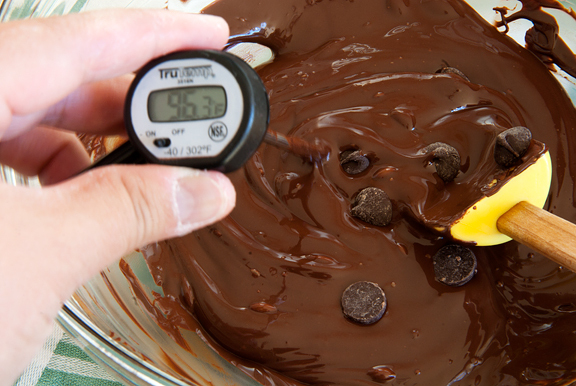 Just a note based on my experience – if you temper the chocolate it’s easiest with a minimum of one pound of chocolate even though you’ll only need a fraction of that amount for the actual coating. The heat capacity of a smaller amount is just too low to maintain a steady working temperature for very long. These days when I have a couple of bananas beyond the point of ripeness for eating, I slice them up and toss them into a big ziploc bag and freeze them. This is quite handy for making a batch of single-ingredient ice cream on demand. I let them thaw just a tad before whirring them up in the food processor. 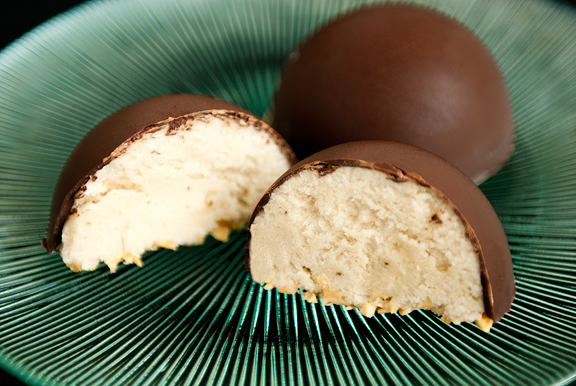 The thing with bombes is that they are usually filled with something that sets – mousse, ice cream, single-ingredient ice cream… So it’s best to have the coating completed and dried/hardened on the bombe molds before you start making the filling. The reason is that once you have made the filling, you will want to pipe it into the bombe molds pretty much right away. A pastry bag makes the process fast and neat. If you take too long noodling about, the ice cream becomes a little frothy and weird. 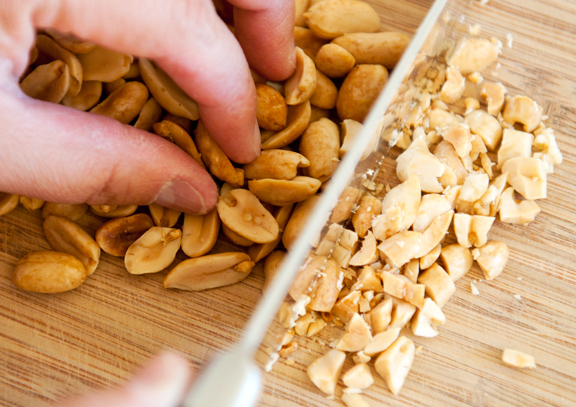 Top it off with some chopped peanuts and gently press them down into the ice cream. Set in the freezer. Take care when unmolding the bombes. They flip out with gusto! You definitely want to unmold them when they are completely frozen or else you may crack the delicate chocolate shell if the insides are soft. 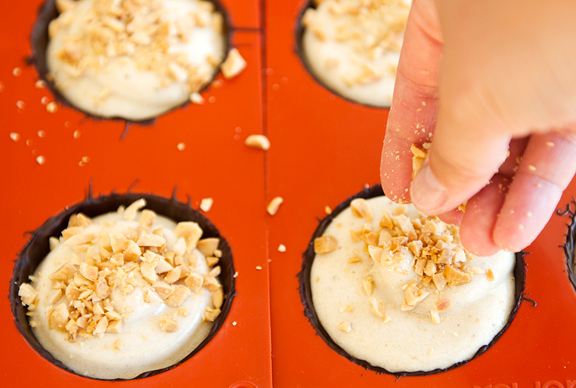 You can unmold them and put them back in the freezer too. Before serving, I’d let them thaw a little because the ice cream is fairly hard when it freezes. It only takes about ten minutes or so depending on your ambient temperature. And there you will have, in essence, a chocolate-dipped frozen banana… but cuter. 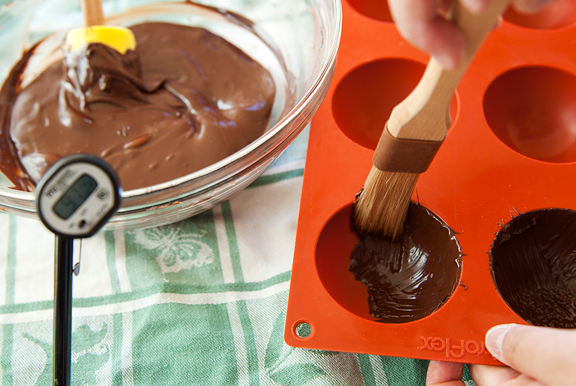 Brush tempered chocolate on the insides of twelve 2 3/4-inch silicone hemisphere molds. When the first layer has cooled and hardened, brush another layer. Repeat until there are three or four layers of chocolate. Let cool and set aside. [This is when you would make the banana ice cream.] 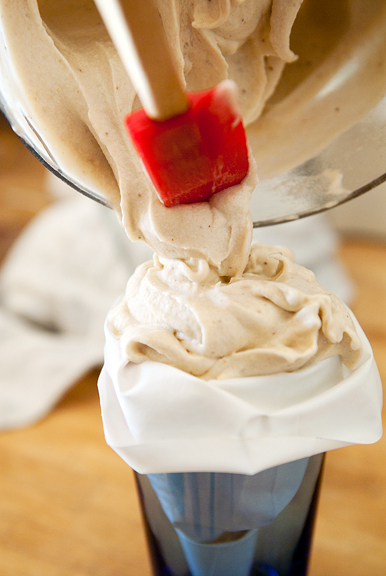 Fill a pastry bag fitted with a plain 1/2-inch piping tip with the banana ice cream. Pipe each mold full of ice cream to the edge (don’t go over, it will look funky when you serve it). 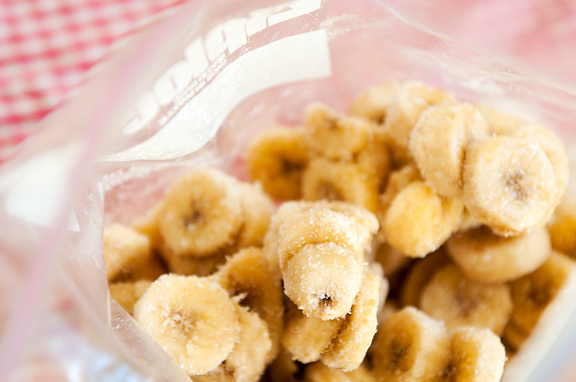 Sprinkle chopped peanuts over the ice cream and gently press the peanuts down into the banana without drowning them. Place in freezer until the ice cream is completely frozen through. Carefully release the bombes from their molds when ice cream is frozen solid. To serve, let thaw for 5-10 minutes or until ice cream yields under moderate pressure. Makes 12 bombes. I so need to get some of those molds… each time you use them I am jealous :) we just enjoyed some of our single ingredient ice cream… YUM. I can taste one right about now. Thanks for sharing! Holy Toledo! These look like the “bombe”! Quite brilliant. Cannot wait to try these. Thanks for posting this! 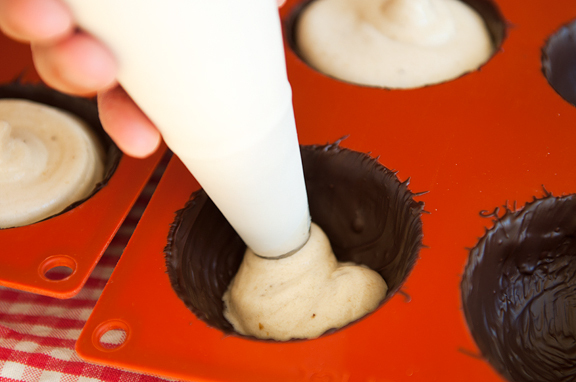 I need to try these right away so I guess that means I will be purchasing a bomb mold….today!! Thank you! WOWZERS, these look fantastic! WHat kind of mold is that? I would like to order some.Thanks! There’s a dessert I wouldn’t feel guilty about…at all. WOW! These look so good! Awesome idea. I wish I had moulds like that so I could make these myself. Chocolate, ice cream, bananas, peanuts in a bite size. This has got to be on the list of perfect foods. This looks AMAZING. I’ve made the single ingredient ice-cream before, and put in a spoonful of peanut butter and honey towards the end, and it was awesome. I love the bombe mold idea. These look adorable! I love this idea! My daughter would love these too; she’s a banana fiend. What a glorious, peaceful sunrise…you can almost “hear” the quiet and stillness in that picture. These look so awesome! Yum!! These make me want to throw a party! But first, I have to dash over to Sur la Table for a bombe mold. I’d love to have these in my next party. They look very inviting in the dinning table or as snack around the house. I totally want to make these… so cute! my 3 favorite flavors combined… da bomb indeed! Oh dear, I’m afraid I can actually make these without a goof – there goes the post-holiday diet! Oh, my gosh. I love this idea. Chocolate and banana are a match made in heaven. Throw in some peanut butter, and I’m drooling. Amazing dessert Jen! What a brilliant idea you came up with! But what do you do with the leftover tempered chocolate? genius, that’s what you are. A bombe would sure put a smile on my face. Totally RAD! I love those and they are so cute, simple ingredients really, too. Thanks so much for sharing & how I love your nature photos, they bring peace to the core of my soul. These look delicious! 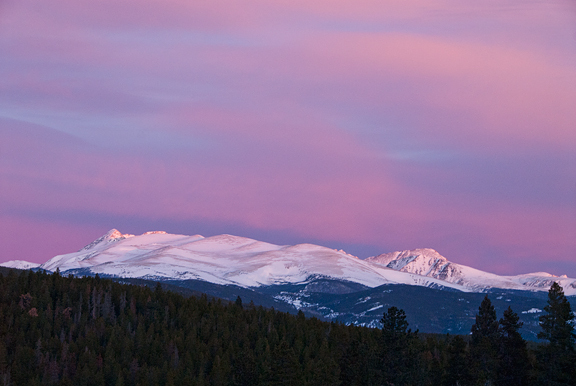 And your sunrise almost made me cry – my boyfriend and I went skiing at Breckenridge last March, and that picture put me right back there for a few seconds. So wish I was there now! Being & Butter (& Bacon) kind of gal, I stumbled upon your web site within the last couple of months. It didn’t take me long to realize that you’re in my neighborhood! In fact, I even had noticed one of the interestingly-shaped clouds in the sky myself whose photo you posted recently, but I saw it before the sunset had gotten ahold of it! And now I see that you’re on the Denver Botanic Garden Bonfils Workshop Schedule for this October. Why-oh-why did it take me so long to find you?! And I, too, say “do what you need to do”…but already I would miss your Blog! my kids would LOVE those, and even tho i hate bananas, they look interesting enough that my curiosity would win out and i would try them, lol. beautiful sunrise. I gotta get me some of those molds—so fun! Wow, these look fantastic! yummie! Holy moly! I love the bomb mold, how cool is that? The chocolate and banana combo sounds delish! Great post! What an awesome idea! I have recently been forced to be dairy free and this would be a great dessert. 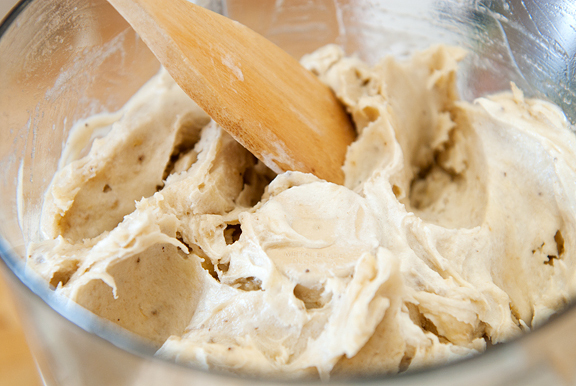 I loved your single-ingredient ice cream and I’m sure I will love these lovelies even more! I was just thinking about that banana ice cream like two minutes ago, and then, voila! Here it is, all wrapped in chocolate! Thank heavens! loved sunrise/sunset in terms of lambda :) and the tiny bombes look super cute! any idea where can i get my hands on those moulds? would love to try this recipie out one day! Just found this through Photograzing… LOVE this recipe! Sunrise is a reward from the universe for waking up early! Banana fudge bombs were my favorite popsicle to order from the icecream man when he made the old neighborhood rounds when I was a kid. Your recipe looks delicious. Annie – yay and happy birthday!! heather – you could! You could do anything you wanted. Ooooh, I love these! Such a great use for banana icecream (which, btw is brilliant).